Apple’s record-setting growth has finally come to an end. During the company’s first quarter earnings call on Tuesday, Apple reported its first year-over-year decline since 2003. 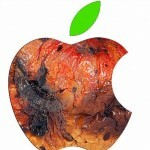 Apple reported revenues of $50.6 billion, down from about $58 billion during the same period last year. The most telling number in Apple’s earnings report is its dwindling iPhone sales—people just aren’t buying enough of them. Apple reported iPhone shipments of about 50 million, down from 61 million last year. One small caveat is that analysts are expecting sales numbers to increase later this year, when Apple is expected to reveal its next iPhone in September. This is the first time in 51 quarters that Apple’s revenues have shrunk. Prior to today’s earnings call, Apple had been experiencing one of the greatest growth periods in American history. Apple lost 80 percent of its stock value between 1991 and 1997, only to grow 21,000 percent in the following two decades. Its unprecedented growth propelled its founder, Steve Jobs, into a legend among the technology community. Apple has mostly relied on record-setting iPhone sales to fuel its growth during the past decade. The iPhone regularly accounts for about two-thirds of the company’s total revenue, and today’s report is no different. The company’s decline comes in the wake of a haphazard iPhone SE launch earlier this year and iPhone 6 Plus release last year. For the better half of a decade, Apple released only one size iPhone each year and released an iterative upgrade every other year. More recently, as iPhone sales have slowed, the company has pulled out all the stops to inflate its sales numbers. Following the release of the iPhone SE earlier this year, it appears that people are finally wising up to the fact that they don’t have to upgrade their phones every year.